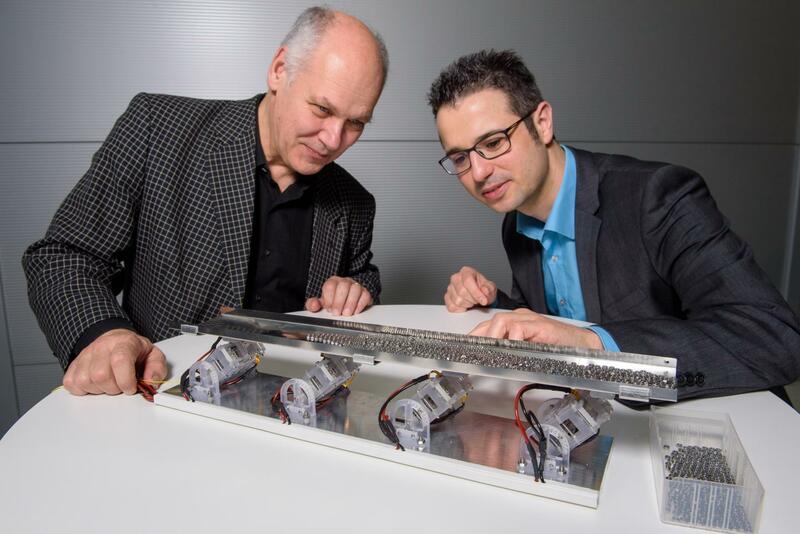 Using artificial-muscle actuators, Stefan Seelecke and his team of engineers at Saarland University have developed a new self-optimizing conveyor technology that adapts itself to the size, weight and desired speed of the materials being conveyed. The technology makes use of silicone polymer-based artificial muscles to transport dry bulk materials of all kinds, from foodstuffs to small metal components. By exploiting the properties of electromechanically active polymers, the Saarbrücken research team has built an actuator that they install at intervals below the conveyor belt. Rapid contractions of the artificial muscles convey the material on the belt, either by projecting the material forward in a series of tiny bounces or sliding it forward in a series of horizontal shoves. As the muscles also have sensor capabilities, they can recognize the weight of the materials being conveyed. The research team will be exhibiting a model of their vibrating conveyor system at Hannover Messe from April 23rd to April 27th at the Saarland Research and Innovation Stand (Hall 2, Stand B46) and are looking for partners with whom they can develop their technology for practical applications. Vibratory conveyors are used in factories and manufacturing plants whenever large quantities of small objects – pills, screws, electrical components, gummy bears, and the like – need to be transported from A to B. Conventional vibrating conveyor belts either pitch the goods forward by means of rotary vibrators (electric motors equipped with eccentric rotating masses) or they make use of the inertia of the goods to move the material forwards using horizontal stick-slip (slow advance, quick return) cycles. Up until now, these systems have always vibrated or oscillated in a fixed manner and have not been able to adapt flexibly to the goods being conveyed. A new adaptable conveyor technology is now being developed by Professor Stefan Seelecke and his research team at the Department of Intelligent Material Systems at Saarland University and at ZeMA (Center for Mechatronics and Automation Technology) in Saarbrücken. Their conveyor system is able to adapt to the size, weight and any special properties of the material being conveyed. It can gently transport fragile materials but can also speed up if materials need to be moved urgently. The engineers in Saarbrücken are specialists in the field of "artificial muscles", which they develop from a range of materials for use in technical equipment such as robots or industrial machinery. In this particular case, the researchers have chosen silicone, an elastically deformable polymer that they can get to contract by applying an electrical voltage. 'We print an electrically conducting layer onto each side of the silicone film. This allows us to apply an electric voltage to the film. When the silicone polymer is prepared in this way, we refer to it as an "electroactive polymer" or, more specifically, as an "dielectric elastomer",' explains Professor Seelecke. If the research engineers then alter the applied voltage, the electrostatic attractive forces change accordingly and the film compresses so that it extends upwards. Three of these silicone 'muscles' are combined to make a stack, which is then mounted below a conveyor made of smooth stainless steel. 'If we apply 1800 volts, the amplitude of the stroke, and thus the distance the goods are pitched forward, is significantly larger than that achievable with the conveyor systems currently available. The frequency and amplitude ranges we can access are also greater. And these components are lightweight, cheap to produce and only require low levels of power,' says Steffen Hau, the doctoral research student who helped develop the conveyor system. The engineers are able to control the motion of the silicone muscles precisely, ranging from high-frequency vibrations to powerful thrusts of high amplitude and high acceleration. As a result, they can create conveyor systems that are able to adapt to the mass and size of the bulk goods that have to be transported. This new type of conveyor can therefore be used to transport very different kinds of goods without the need to reconfigure the conveyor between loads. In fact, the conveyor system is designed to recognize the type of load and make the appropriate adjustments automatically. The control unit can precisely calculate and program the required motion. 'We can assign specific deformations in the film to specific changes in the film's capacitance. By studying the electrical measurement data, we know the extent of mechanical deformation in the polymer film at any moment. This effectively imparts sensor properties to the electroactive polymer actuator. By controlling the voltage, we can carefully control the motion of the actuator,' explains doctoral research student Paul Motzki, a research assistant in Professor Seelecke's group. The research team are using the measurement data to integrate a weighing function into the system that will be able to determine the weight of the goods being conveyed. The goal is to develop a conveyor system that can work autonomously by adjusting its control signal to reflect the nature of the materials being transported. In 2017, the engineering team from Saarbrücken won a number of awards for their system: At the 'EuroEAP' conference in Cartagena, Spain their conveyor system was awarded first prize in the 'EuroEAP Society Challenge'. Prior to that, the team took second place in the 'SPIE Challenge', which was part of the 'SPIE 2017' conference in Portland, Orgeon, USA.